Always inspired by my design idol Kelly Wearstler. Her photos are always so gorgeous and rich in color. Purples, pinks, reds, paintings, oh my! Definitely feeling on her vibe and her life. With all of this beauty, fashion, art and color around you...wouldn't you be inspired? I am so in love with this playful office decorated by caitlin wilson. love her. 1. Getting mentioned as inspiration for new bloggers and why they started. Thanks Ana! 2. Having a junior designer at Studio M include me in her bio as her inspiration! So sweet. 3. knowing that your creative counterparts (like jaime at ISUWANNE) are on the same page. Aren't we all dying to know? Thanks to my friend over at Sketch42 I found out that Kelly Wearstler has a new blog and the news is spreading fast. MyVibeMyLife is a collection of the beautiful images she takes in her daily life. I love her first post on how she puts together her ideas. She is so clever, she uses "vibe trays" to organize her thoughts. Brilliant. Check out her new fabulous + fun website! Hello, Splendor, I ADORE you! I am absolutely obsessed with this issue of Adore Home Magazine. It's full of the most inspiring ideas and photos of out-of-this-world decorating. You must read this entire issue, every page is GORGEOUS!!!! do you like this look that I posted a while back on fur? Beth shares her secrets on how to get this look! but I am kind of obsessing over one for my apartment. This is the office space of my fellow Los Angeles blogger Rebecca of lovng.living.small. Her adorable little office space just brightens my day. I just love her collections of books and personal photographs throughout the home. Those items display such character. My heart also has a soft spot for that black and white chevron footstool. I think we are all loving gray walls lately, right? So fresh! Check out the rest of her hollywood bungalow home office tour! Check out MadeByGirl, Jen, and her super cute house tour! In her guest bedroom (my fave) she shows a superb way to use yellow! It can totally be difficult to nail yellow, but she did it and she mixes playful patterns to boot! Here she is in her home office. Totally office space of the day worthy, no? you are absolutely, breathtakingly, incredibly adorable! In complete adoration of this lovely little dining room nook in Jessica's apartment. The beautiful + happy shade of blue on the walls is so fun. Throw in all white glossy painted furniture with bright + colorful books and accessories and you have yourself a perfectly posh little entertaining space. The blue and white ceramics always get me too! For more of her pad check her out here. I also happen to adore the styled coffee table sitting above a gorgeous zebra rug. This print is soooo EVERYTHING! I love love love the lavender hue. I just adore Caitlin and her style. 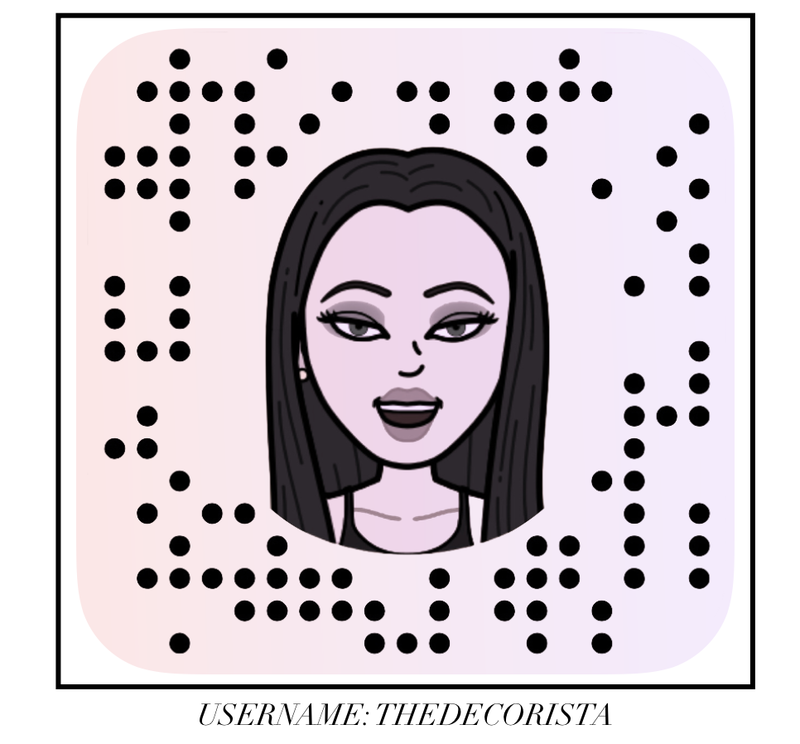 It's so very decorista! We are just moments away from choosing the winner of my Zebra rug giveaway. I am more than thrilled. 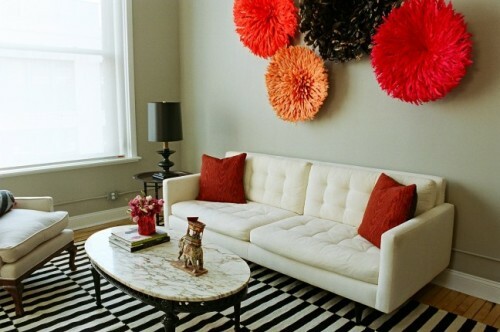 how she used the same zebra rug in her stylin' home. 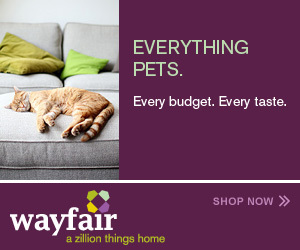 It's neighbored by a gorgeous glossy black dresser and 2 hot pink moroccan poofs. And to top it off, it's in a cute little girls room. What: a gorgeous lawyer by day and extremely stylish design blogger of Odi et Amo. 1. A great bed. I know it's been said a thousand times before, but it bears repeating here: a great bed is a luxury not worth going without. Buy the best mattress you can afford and top it with the best sheets you can afford (stick with white -- it's a classic, clean look that will go with any style and a little bleach will keep them gorgeous for years). 2. Orchids. As much as I love flowers, I'm sadly allergic to most of them. Fortunately though, I've been spared any allergy to my absolute favorite flower -- the orchid. I love the architectural shape of an orchid's flower. The deep waxy green of its leaves. And the fact that so long as I give them some partial sunlight and a bit of water once a week, I can keep an orchid looking happy and beautiful for weeks. 3. Blue. After painting the master bedroom in our town home blue in 2006, I realized how calming a deep, soothing blue can really be. When we moved into our new home last August, I decided to carry blue throughout the entire downstairs. Between my navy and white dining room, blue-green breakfast nook, blue wallpapered powder room, and dark and light blue living room, I'll admit it's a whole lot of blue. But it makes me happy every time I walk through the front door after a long day at the office. 4. My favorite candle. 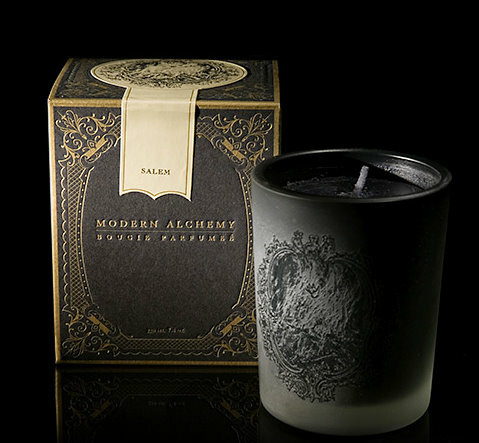 I'm a huge fan of fancy candles, and I admittedly indulge myself way too often and purchase another one, but after several years of hunting I still haven't found one I love as much as the Salem candle by Modern Alchemy. The bonfire scent is wholly intoxicating, and goes a long way to making up for the fact that we don't have a wood-burning fireplace. 5. Cute (and comfy) lounge wear. I'm one of those people who changes into lounge wear as soon as I get home from work. After a long day at the office and a long commute home, I can't bear to wear my office clothes a moment longer than absolutely necessary. That said though, I try not to look like a total schlep around the house (for my own sake as well as for my husband's), so I've invested in some lounge wear that also happens to be cute. Favorites include Nordstrom (for Make+Model, Natori, Alo and DKNY), Lululemon Athletica (and yes, I know it's yoga gear but it works equally well for those of us who are, regrettably, less active) and Gap Body. 6. 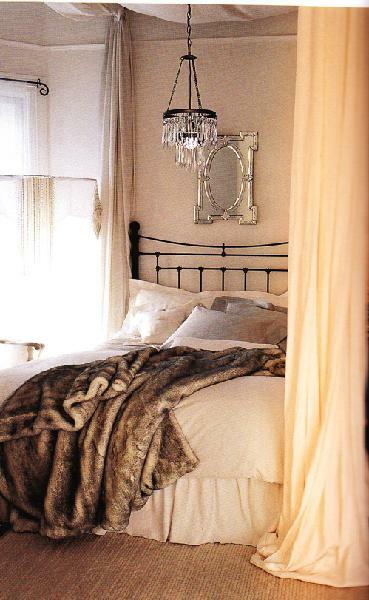 A luxurious throw. I'm a huge fan of snuggling up on the couch at night, either to read, watch TV or surf the internet. And when I'm lounging, I love to have a cozy throw across my lap (admittedly Olivia, my two-year old dachshund is rather fond of throws, too). I'm a big fan of Restoration Hardware's luxury plush collection throw -- it's incredibly, seductively soft. 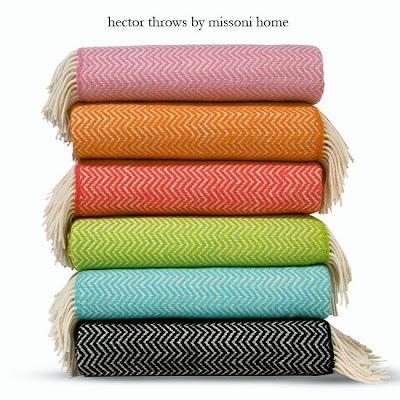 But I'd kill for one of Missoni Home's Hector throws, preferably in a bright, candy-color. For a less expensive alternative to the Missoni, try Nate Berkus for HSN's woven knit throw, which comes in black or gold. 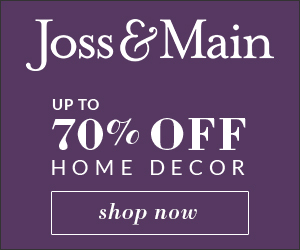 Thank you, Ashlina, for inviting me to share my "Six Secrets for Domestic Bliss"! For me, at least, domestic bliss = domestic tranquility. And so my big focus at home is on comfort (with style, of course!). The goal is to soothe all the senses, relax away the worries of the day...all so I can enjoy my evenings and weekends with my husband and darling pets. Averill, you are a rockstar my dear! Thank you so much for sharing and enjoy your vacay! and with my recent obsession/fascination with lighting...i thought i'd go ahead and share. I think it all started at the Gramercy Hotel lobby in NYC. This is why I LOVE hotel design, whatever the trend they make it perfection. Want to learn how to make your very own? Check out my sweet friend Alison and her DIY tutorial...her creation blew me away! In honor of Mothers Day, today I wanted to showcase this amazing mother/daughter team who are as delightful as their blog and their endless lingerie inspiration just radiates all things femme. I am kind of obsessed! And how could I not support my local LA ladies? 1. A sunny, light-filled room is so important to me...I even make sure my boutique is cheerful and bright at all times. Perhaps I'm solar-powered, but I love natural light and light surfaces & mirrors to enhance the effect. I painted the floors in my house white, and also recently had the floors in my store painted a high-gloss white just like this. The shine on the floor makes the room that much brighter! 2. A lovely fragrance goes a long way. I have a slight obsession with Diptyque products, especially the 'Roses' room spray. I use it almost daily in my home, and also have my Diptyque candles that are perfection. 3. 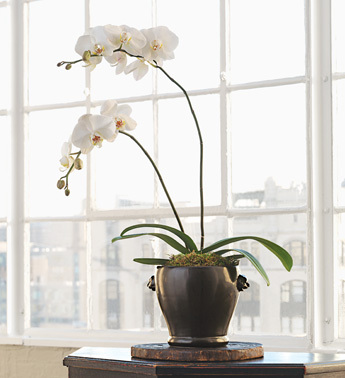 Fresh-cut flowers elevate the mood of the room and make a space complete. I really make an effort to have fresh flowers in the house throughout the year, and of course peonies are my favorite. Here's a display I photographed in an antique urn that I absolutely love. Fresh-cut roses in my bathroom...yes, I need my flowers in most of the rooms! 4. 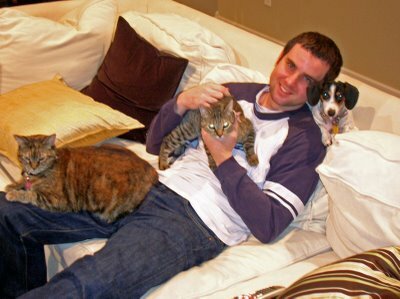 Coming home to a pet that you love. Here is Chickie, my pomeranian. She's one of my 2 dogs and 4 cats...yes, I have a pet adoption addiction! Sometimes there's nothing better than seeing that sweet little face after a long day. 5. Books. I treasure my books...I'm one of those people who doesn't even loan books to friends because I don't want to lose them! I'm so proud of the collection that I've read, and excited about the collection I will someday read. I love ending my day with a good book, so displaying something that I enjoy only makes sense. Even if you don't enjoy reading, they sure make wonderful home accents! 6. Sweets! Anyone who knows me knows about my sweet tooth, and the running joke in my family is that my house is like a bakery (basically it's a place to avoid if you're on a diet). I don't cook, but I certainly do bake! Pretty much not a week goes by when I'm not making cookies, brownies, a cake, etc. I'm all about comfort food! Hello everyone. My name is Julie and I’m thrilled that Ashlina asked me to participate in her Six to Bliss Series! There are so many things that contribute to my personal domestic bliss, it was hard to narrow down the list to just six. After some time thinking the list over, I settled on the six little things that bring me the most joy in my home everyday (besides my husband and two kitties). 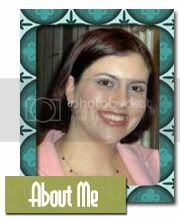 I hope you enjoy learning a little about me and I thank Ashlina for allowing me to share! 1) The freshly brewed coffee in the morning! One of my favorite ways to start the day is with a fresh pot of coffee – it smells wonderful and I actually prefer a homemade cup over Starbucks! My secret ingredient is Coffee Mate Creamer in Hazelnut (non fat) topped with a dollop of whipped cream. I seriously makes me happy! 2) Vases of fresh cut flowers. Any chance I get, I place small arrangements of fresh blooms around my apartment. It’s a wonderful way to add color and bring a little bit of the outdoors inside. 3) Clean, crisp bedding. I love clean sheets and wash ours every couple of days…I swear I sleep better in freshly laundered sheets. 4) Stacks of chunky cocktail table books. Our living room is filled with stacks of design books and magazines. Books are a great way to accessorize as well as provide guests with something to do; they also keep me inspired on a daily basis. 5) Pretty bath products. I love scented bath and body products, especially when they come in pretty packaging! Displaying a collection of lovely bottles and soaps neatly on tray is a stylish and practical way to accessorize your bathroom countertop. 6) Lots of accent pillows. Our sofa is filled with accent pillows – all different colors, patterns and textures. Pillows add an element of comfort and are the easiest thing to change when you decide it’s time to update your look. Julie...thank you so much for sharing with us your SIX TO BLISS. You are a complete inspiration to me, i absolutely just love what you do!